The high efficiency levels of cogeneration systems are due to the use of the heat generated by electrical generation being used as a sub product, leading to prime energy system savings. By producing and consuming electricity within the same installation, energy losses are avoided therefore increasing the overall energy efficiency in the plant. A diesel genset built with a thermal application which includes heat exchanger plates and an exhaust gas exchanger to recover normal heat loss and use this to heat sanitary water. Taking in to account that this project was for an ecologically designated location, a low emissions engine is incorporated compliant to Stage III emissions rating. It contains a sustainable system designed which uses the heat generated by the genset to provide sanitary hot water for the camping site kitchens, bathrooms and day to day activity on the campsite of the protected island of Ons in Galicia, northwest Spain. It entails using a thermostatic controlled system to reuse waste gas for heating water. The solution designed by Genesal Energy, and in collaboration with Magaral engineering, is made up of a 60-66 Kvas genset in a 2900mm long soundproofed cabin. 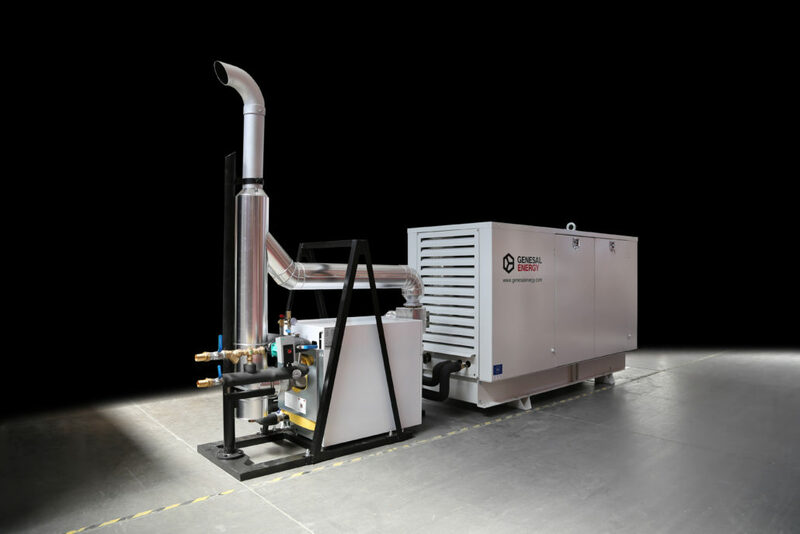 The genset has a high attenuating silencer for the exhaust pipe, not to mention many more specifications that make this much more than a conventional electrical generator and quite unique.